Oh I've been having fun today. I'm working on my Dresden plate, and have almost finished the first row. It is time consuming, and fiddly, and I absolutely love the way it is looking. 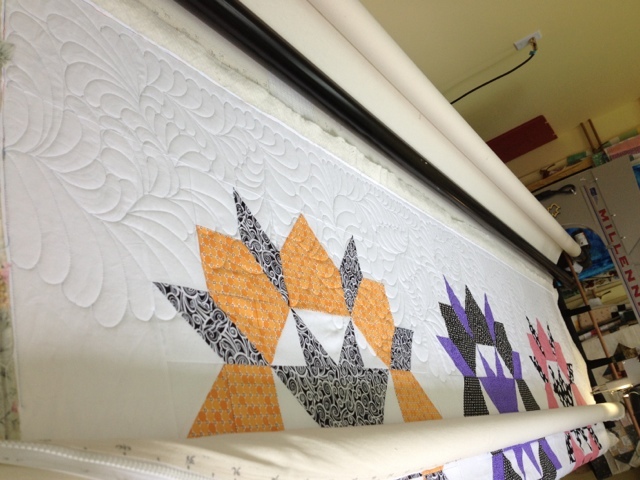 I love quilts that have large background areas to fill with luscious feathers. I'm using one of those Frixion pens to mark the spines of the feathers, and I must say I'm impressed. It disappeared with just the lightest touch of the steam iron. The other great part of today was visiting with Avery on Skype. We've been doing this for quite a few months now, and he's getting quite into talking and visiting over the computer. It's fabulous to be able to see him, and watch him as he grows and learns new things. For the stash report, there has been some good usage numbers this week, between a backing, and the border for a quilt, and cutting more pieces for another. However, I did buy some more this week, but it has a specific purpose, and will hopefully get used up in August, since I want to participate in Judy's next quilt along, Road to Brenham. Balance: 71.75 more yards in than out. I'm linking up to Judy's Stash Report, and then I'm going to finish up the Meteor Shower block that I started last night. I made the mistake, just out of curiosity, of counting how many pieces are in each of those blocks..... 103 pieces. No wonder each one takes so long. It's been a lovely day for staying indoors and sewing. It's been rainy and damp, a perfect day for leisurely sewing. I finally have a finish. The 36 patch quilt now has all its borders on and is ready to go into the line-up for quilting. It feels so good to finally have something finished. I've been bouncing around from one project to another lately, and I would so much like to get more focused and get more things to the finish stage. So, after this one, I think I will focus on Meteor Shower and work on it until it is done. I love starting new projects, but I am starting to get overwhelmed by all the unfinished ones hanging around here, so I'll try to concentrate on at least one more finish, before starting anything else. Angie, who blogs at Quilting on the Crescent, is having a celebrate sewing linky party, in honour of a special lady named Anne, who ended up being the patron saint of sewers and seamstresses. I didn't even know there was such a thing. So, I think I'll link up there, and join the party. I loaded on one of my own quilts today. One of my Getting it Done goals for July was to get my Dresden Plate quilt finished. I spent a lot of time yesterday trying to figure out how to quilt it and thought I had come up with a plan. Well that plan got scrapped one I started since I found something I liked better. They both involved feathers but I like the way these flow better than the original idea. I have a couple of things up today. We had a sewing day at the guild on Saturday, and I took my quilt project Thanksgiving, which is a pattern by Judy Martin, in her book Patchwork Among Friends. I took this one because I figured it needed less concentration than Meteor Shower, so that I'd be able to visit and sew at the same time, without running into problems. Well, this wasn't quite true, so there was a bit of ripping done, because I wasn't paying close enough attention to what I was doing. But, I came away from the day with another block done. Four down, 12 to go. The other one I have up is Meteor Shower. I have 4 blocks done, and another about a third of the way done. This quilt needs 13 of the 2 coloured blocks. This too, is a Judy Martin pattern, from her book Scraps. I'm hoping to do some more on this one today, and get that 5th block done. We're planning to take off for a week camping either tomorrow or the next day, so I need to get some projects ready to take with me, as well. I'm just not sure yet, what I want to take. It isn't likely that we'll get a hydro site, so whatever I take will have to be hand work. I'll have to rummage around and see what I can find. Maybe I'll have time to get some more prepared for My Tweets, and get back to working on that one. 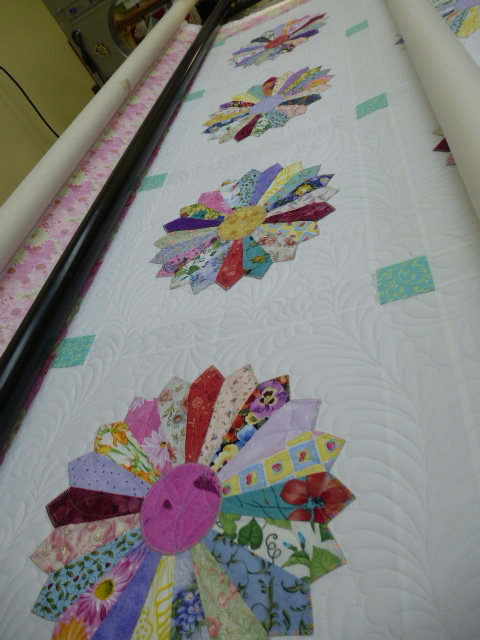 I'm linking up to Judy's Patchwork Times Design Wall Monday, where there's lots of other fun and inspiring things to see. Once again, the week got away from me, with not a whole lot of sewing done. And what did get done, had already been cut and accounted for, so there isn't a whole lot of change in the numbers this week. I needed to cut a little more for Meteor Showers, and I used some strips yesterday at our guilds sew day to make a slab block for the victims of the floods in Alberta, and that was it. I have made some progress on Meteor Showers, with another block finished this week, so that's something. I'll have pictures tomorrow. Balance: 78.45 more yards added than used. On the positive side for accomplishments this week, I've gotten 2 customer quilts finished, spent the day on Thursday with our son, and spent the day on Friday with our grandson, which really added to the wonderfulness of the week. And today I've loaded another quilt that needs to be finished by Tuesday, because I think we might be going away for a week, and she wants the quilt before August 2nd. So I'd best get it done before we leave, to allow for some flexibility in pick up times. I'm linking up to Judy's Stash Report link box, and then I'm going to work on another Meteor Shower block. Laurie came down with Avery for the weekend today, and he came to our house to play. We had so much fun. We went to the park where there was a wading pool for the little kids, and played there for a couple of hours. It was really hot, but so much fun. It was so hot, that I abandoned all restraint, and decided to sit down in the wading pool, fully clothed. It felt so good. But, I suspect that, after we finished at the park and went over to order the pizza, it must have looked a little strange to have this lady walk into the restaurant in wet jeans. LOL!! After we all had our pizza for supper we went out into the back yard to play. I have been dreaming about this happening ever since we moved in here, being able to see Avery playing in the yard, and today was the day. Back when Noel was little, one of his favourite toys were these small little airplanes. He used to love going out with his daddy to play with them. We saw some of them at the checkout the last time we were in Canadian Tire, and grabbed some, thinking it would be fun to see Noel Playing with his favourite toy with his son. We were right. Avery couldn't quite get the concept of throwing them, but he sure had the chase and get them and bring them back to Daddy or Grampy to throw game down pat. It brought back some great memories of doing the same with Noel. Matt brought out a remote control helicopter that had Avery absolutely fascinated. It was so much fun watching my 3 boys playing together with the planes and helicopter. Noel showed Avery how the remote control worked, and the look on Avery's face when he moved the knob and made the helicopter move was priceless. Such a wonderful day, filled with family and love. Thank you, Lord, for the gift of loving family. I recently finished this quilt for Carol, who blogs at Quilt As Desired. If I have my facts straight, this is a quilt she made up for a friend of hers, using fabric from Hawaiian shirts of his that he gave to Carol to cut up for a quilt. She put together this beauty of a quilt. It was so much fun seeing all the different fabrics, and motifs and people and animals in the fabrics. She chose a fern leaf pantograph that looks almost identical to a palm leaf, for the quilting design. It complimented the fabrics and the piecing beautifully. This is why I love long arming for other people. I would never get to see the variety of quilts that I do, if I were only doing my own. Thanks, Carol, for letting me do this wonderful quilt. No sewing done in the last couple of days, again. We went out today and picked up some blueberries and raspberries and also some farm fresh peas. I actually had never had fresh peas before yesterday, when we picked some up to try. Before then, they had always been either frozen, or canned. I couldn't believe how good they were! We shelled them and cooked them up, and had them for supper last night. There were enough left over to put into the fridge for today. I had them cold, with chicken salad for supper, and they were just as yummy. So, today's job was to shell, and blanch and package up 2 bags of peas. After they are frozen, I'm going to taste test them again, and if they work out, we'll spring for a bushel of them to do for our freezers. The raspberries and the blueberries are for jams, which will be tomorrow's job. I did manage to get my blocks for the Bonnie Hunter Lazy Sunday Mystery put up onto the wall, just to see what they look like. I have no idea where she is going with this one. There are still lots of parts that haven't been all put together yet. I'm guessing it will be alternating blocks, set on point, with maybe a sashing of some sort between the blocks. I am noticing looking at this picture that the yellow star points have kind of disappeared, but that might be because the lighting isn't the greatest. There are still 4 patches left over, although that might be because I made too many, and a whole pile of green half square triangles left over. 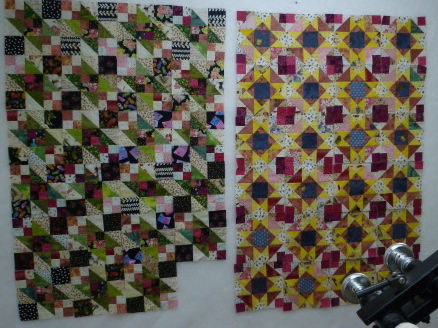 Right now, it looks like I have blocks for 2 totally unrelated quilts up there, but that is the fun part of mysteries, seeing how they eventually work out. I'm linking up to Judy's Patchwork Times where there are walls with lots of fun and interesting stuff. Well, after the fun of the fabric delivery earlier this week, I now have to 'fess up to the numbers and Link up to Judy's Stash Report. I have had some out numbers this week, as well, since I've been cutting and doing a little sewing on Meteor Showers. Balance: 78.75 yards more in than out. Yikes!! Ah well, I've been saying for years that it is going towards my retirement fund. And I have a bit of news regarding that retirement. I had meant to keep on working until September. There were a lot of factors that had September as the goal, the biggest one being that there are changes coming at the hospital that I don't want to be a part of. I didn't think they would be bringing in those changes during the summer and the high vacation rate for all the staff. Well, they are bringing in those changes faster than I thought they would, with no warning and no discussion with the nursing staff involved in those changes. With the combination of those changes, and the very poor attitude of the management staff to the nurses providing the care to all the patients, and their attitude towards the patients as well, I just can't, in all good conscience, continue to do the job. My own attitude has gotten to the point where I hate going in to work, and am thus no longer effective in the job. So, after much thought and prayer, and discussion with my husband, we have decided it is best for everyone if I quit the job now, rather than 2 months from now. And I must say, my current overwhelming feeling is one of intense relief! I wonder how long it will take for the reality to set in? Just think...... I can quilt and do my long arm and my blog and not have to say that I have to cut it short and go in to work at 3...... Thank you Lord! 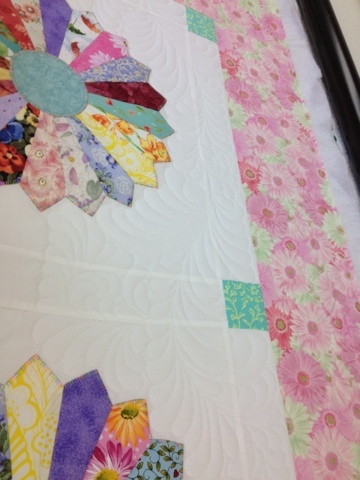 I'm working on Gail's Swoon quilt. She wanted an all over feather meander. After a few false starts, due to a thread colour change and a bit of ripping, here's what it looks like, so far. She's used a lot of fun and bright fabrics and it is a lot of fun to work on this one. There is nothing on my wall today. I've taken down the 36 patch quilt, and it is stacked and labeled and ready to sew together. I just haven't gotten that far yet. I've been working this past week on getting the 3rd clue of the Lazy Sunday Mystery quilt finished. I can now happily report that I have all of the rectangle units done, and 5 out of 24 blocks sewn together. I'm getting very curious to see what the final product will look like. And, my package from Thousands of Bolts arrived this morning with all of its lovely goodness. I have wanted to do a Lady of the Lake quilt for ages and ages. I've been seeing quilts lately with the colours red, yellow and grey together, and really like that combination, although I'm thinking I'll add a bit of aqua as well. So, these are the reds I ordered, some of which have the colours combined in them already. Here are the greys, with some blacks thrown in. I'm not sure yet, whether I'll use the blacks or not. I'll have to see what develops, once I start it. And the yellows are here. I have more in my stash to round these out. And then finally, for the Lady of the Lake fabrics, that is, I found this fun print with all the colours in it. I might use it in a couple of the blocks, and then also as a border. I thought it was so much fun. And then the rest of the box was filled with all kinds of neutral goodness, to replace the ones that have been used up over the past couple of months. You'd think that, since I've used up so many, I'd have quilts to show for it. Unfortunately, they are all languishing in the land of unfinished projects. So, I have promised myself no more starts until I have at least one finish. I wonder if I'll keep that promise? I did spend some time last night cutting more pieces for Meteor Shower. I'd like to say I'll get more cut today, but I have to work 3-11 today and tomorrow at the hospital. Considering it's 1:16 at the moment, and I have yet to have anything to eat today, let alone get my supper ready to take with me, and get changed and ready to go, it's not likely that I'll get much more done after posting this. So, I'll sign this off, and link it up to Judy's Design Wall Monday page. Today has been a fabulous day. It started with a wonderful sleep in, although that seems to be something I'm always doing. LOL! Early mornings aren't my favourite thing in the world. Anyway, like I said, a lovely sleep in, and a couple of leisurely cups of coffee, accompanied by facebook and blog reading. Then I decided to make myself a list of things I wanted to get done today. I wanted to bake some bread. And here it is, a loaf of white bread and a loaf of 12 grain bread. After all, we have all that jam from last week. And there is nothing better with home made jam than home made bread. Each of those loaves are going to be cut in half, since they will go mouldy before Scott and I can eat all of it. The other half of each will go to Matt and Becca. I wanted to spend some time sitting outside doing some stitching. Once the rain stopped, I was able to go outside and enjoy the warm air and the sounds of the birds, and stitch up this Sunbonnet Baby for my Grandmother's Choice block of the week project. It has been so long since I've done any hand stitching like this. I find I'm missing it. I think I just might have to did out my applique stuff and get back at it. I also put on that list that I wanted to do this week's block for Grandmother's Choice, but I haven't started that, just yet. Then, I got to spend about 20 minutes with Avery on Skype. What a lovely little boy he is. They are at the beginning stages of potty training. Ah yes, there are definitely bonuses to being Grammy, and not having to do the potty training thing is definitely one of them. However, if they could be closer, I'd willingly pitch in with the potty training. But, even without them being here, I love being able to talk to him like that every week, and see him. And they are coming down for a visit in a couple of weeks, which will be so much fun. Anyway, back to that list, I put on that list that I want to start the next blocks for Meteor Shower as well today. I'm going to do that as soon as I'm finished here. The other thing I need to do is my Stash Report. No change in it, at all. But I suspect that big order will be arriving sometime this week, so I'd better get some more cutting done, to balance off the incoming numbers. Balance: 55.85 more yards in than out. Micki's disappearing nine patch quilt. She wanted an overall pattern of hearts and loops. It's about half finished and should be completely done by later this afternoon. Except that it turned into two days work. But it sure was worth it. There are a total of 3 pints and 17 half pints of jam here. Eight of the half pints are a strawberry/orange combination, and the rest are plain ordinary but yummy strawberry jam. And from doing all this I have found that the way our kitchen is designed is perfect. There was a minimum of steps involved in doing this. All I had to do was turn and I could reach all the work surfaces. I loved our kitchen before, and now I for sure love it, because it works. This was the true test. 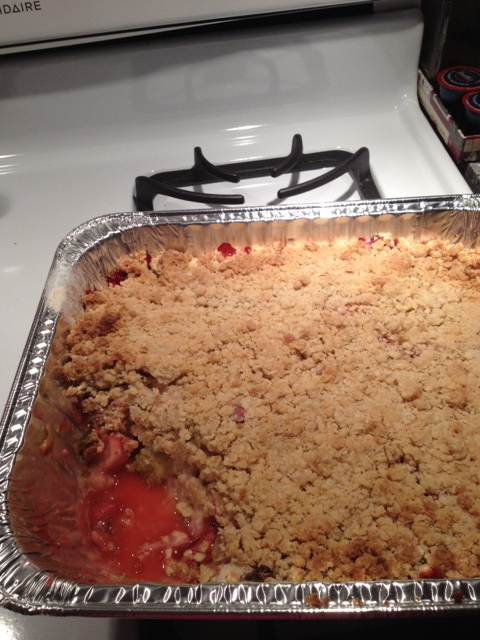 I also made a Strawberry Rhubarb Crunch which was a definite hit. Between the 2 of us, and Matt and Becca, there isn't any left. And then, there is a batch of Strawberry ice cream and a batch of strawberry frozen yogurt. There was enough of each of those to divide up into a 1 litre container each for Scott and I and Matt and Becca. It's a good thing we have them to help us eat all this stuff, or Scott and I would be as big as houses. LOL! So, now that all that is done, I can get back to working on quilts, at least until raspberries come into season. And then there's blueberries to do. By the end of the summer the cold room will be full of lots of yummy sweet jams. By this time tomorrow I'm hoping to have strawberry ice cream, strawberry frozen yogurt, strawberry jam, strawberry-orange jam and strawberry-rhubarb jam. 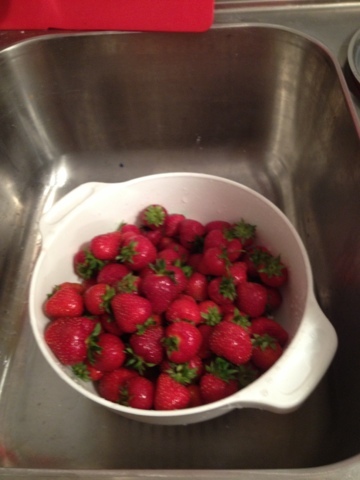 Tonight, after I get them all washed and hulled, I'm looking to do some strawberry muffins and a strawberry-rhubarb crisp. I can't believe a week has gone by since I wrote anything here. Time has just been going way too. fast. It's not that I haven't been doing anything, but more like I've been doing too much, and haven't been slowing down enough to enjoy it, or write about it. So this is going to be a combination of at least 2 different posts..... stash report and getting it done challenge report. I suppose I could do design wall report too, but since there isn't anything new there, that's an easy one. Balance: 55.85 more yards in than out. And that number is about to go up. Thousands of Bolts is having a sale on their fat quarters at the moment. Since I have been doing a fair amount of sewing lately, just not writing about it or taking pictures (bad blogger), I've used up almost all my selection of light neutrals. So, I've ordered a whole pile more. And then, because a Lady of the Lake quilt, done in reds/greys/aquas/yellows is on my want-to-do list, I ordered a whole pile of those, too. And after all, I haven't had any fabric input since week 15, so it's time for a reload. LOL!! Ok, what's next...... progress report on Getting it Done Challenge. Last month I listed 4 things I wanted to get done. 1. Catch up on Grandmother's Choice blocks. I have the last 4 blocks done, but I'm still 6 behind. I'm supposed to have 44 done, but I only have 38. But, I'll count this as good, because at least some of it was done. Some of the blocks that aren't done need to be printed out, and our printer is out of ink. That's my story, and I'm sticking to it. 2. Get step 3 of Lazy Sunday Mystery finished. This is really close to being done, so that's another I'll count as almost accomplished, and therefore good. This one didn't get done either. But, it did get sent off in a box, along with 6 or 7 other unquilted tops, to a shop in Calgary called My Sewing Room. 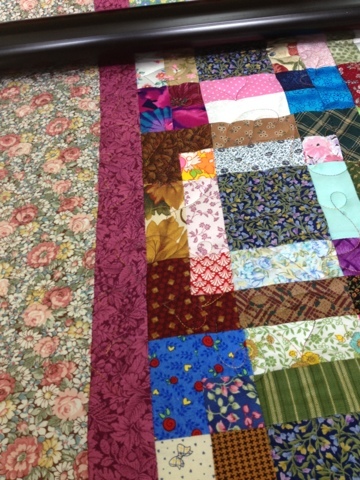 They are quilting and binding tops for the victims of the flooding in southern Alberta. I had more quilt tops here than I could possibly quilt or use, so I sent them off where they can be finished and used. So I'll count this one as done, since it is no longer here. 1. Grandmother's Choice..... keep up and maybe even catch up. comes to mind is to do feathers, but I want to challenge myself to try something new and different, I'm just not quite sure what, yet. 3. I'm really being tempted by the Deck-ade the halls quilt along that I'm seeing on various blogs, and I think I might like to do this one. 4. Finish step 3 of the Lazy Sunday Mystery.